When government officials abuse their power, they are making themselves known as servants of evil. It was true when Bullinger wrote it, and it’s true now. How Can You Tell That You’re Like Job? 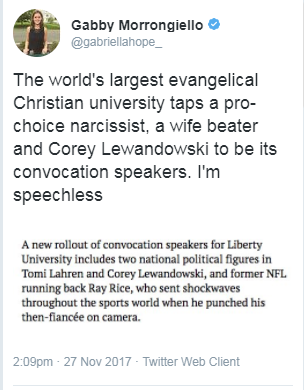 Evidently Liberty U can’t locate any Christians to speak at its convocations. Liberty has well and truly liberated itself from Christian moorings. It is nothing more than a haven for far right politics. Even though far more Catholics shopped online than in churches on Black Friday weekend, they are apparently not done yet. A new EOTT survey released Sunday estimates that some 67-million Roman Catholics will shop online for their remission of temporal punishment in purgatory due for sins after absolution on Cyber Monday. That’s up only slightly from last year’s 65-million shoppers. With Walmart and Amazon recently entering the Cyber Monday indulgence “game,” the Church is now offering heavy discounts as well, not only online but, more crucially, in churches. That move, which reflects how penitents shopped for forgiveness in 2016, is also meant to lower the stress of the Vatican website, which last year buckled under the intense eSpiritual-commerce pressure that naturally comes with Cyber Monday. The evidence of the migration of “church shopping” to eSpiritual-commerce is incontrovertible: Eternal Fortune Magazine told EOTT on Sunday that eSpiritual-commerce sales between Thanksgiving and Saturday rose 13.7% to top $6.1 billion in new indulgences. “The brick-and-mortar churches have made a big leap with their online efforts this year,” USCCB analyst Devin Thomas told EOTT yesterday. “They’re starting to get it. The USCCB says 63% of Black Friday indulgences placed on their website came from mobile devices…something we believe shows Catholics are growing more comfortable with pushing the “forgive me” button on smartphones. 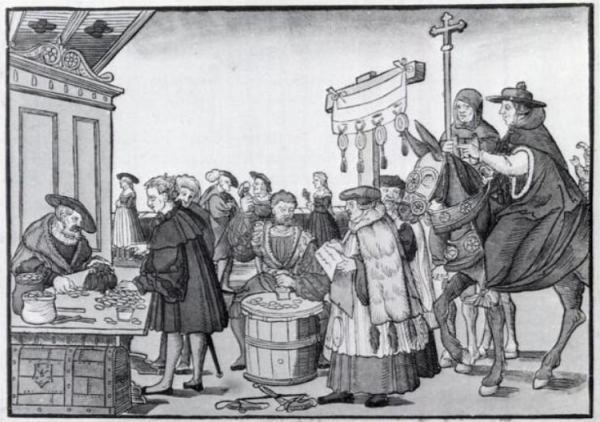 Oh, and this is a good time to remind you that Luther lost the indulgence controversy. They’re still selling them, Martin (for real, they still sell indulgences). And yet the Trumpians are claiming there wasn’t- so here it is. Now stop believing Fox News and Trump. They both lie. Moving beyond the all-too-common shallow recognition of differences, Sacred Dissonance: The Blessing of Difference in Jewish- Christian Dialogue explores the essential distinctions between religious identities and the cultural boundaries between Jews and Christians. Co-authored by colleagues deeply committed to their respective faiths—one a Jewish lawyer, one a Christian New Testament scholar—this book stands in opposition to the notion that all religions are basically the same, an idea commonly put forward in many secular circles or among those who follow personally appointed folkways rather than traditional religions. Through deeply introspective essays on topics as personal as neighborhood relations and hospitality, and as difficult and sweeping as the Holocaust, Sacred Dissonance challenges the notion that a passive and self-contained approach to religious distinction will bring about peaceful coexistence. In candid conversations between the authors, every section of Sacred Dissonance models the ways in which conversation can be the means of both addressing a difficult past and a challenging present. In the course of exploring the ways in which Jews and Christians can speak to one another, Le Donne and Behrendt show that Christianity can become a “pro-Jewish” religion, Judaism can become a “pro-Christian” religion, and communities of faith can open space for others, rather than turning them away, even without breaking down the differences between them. Hendrickson has provided a copy for review. Allow me to begin this review not with the contents of the book proper but with the Foreword- by AJ Levine. It’s the ideal lead-in to the volume and is worth the price of admission all by itself. Her taxonomy of debate and conversation is one of the most astute pieces of literary art you’ll ever read. And it only gets better from there. Her 3 pages are super. The volume itself is a series of chapters written by our dialogue partners addressing specific questions of Jewish-Christian dialogue and then a recording transcript of their followup discussions. So, for instance, when they discuss the Holocaust we have a chapter by Behrendt and then a chapter by Le Donne and then a transcript of their followup discussion. It’s a pretty neat way to organize a volume and they cover the central issues except the one that I wish they had discussed- the Modern State of Israel and Christian Zionism. And apparently they knew I would be interested in that (along with others no doubt) because in the Preface they explain why that discussion is absent. I honestly wish they had come to a different conclusion because to my mind the question of Jewish-Christian relations cannot move forward until we discuss the interconnectedness of Evangelical Fundamentalism as manifested in Christian Zionism and the Modern State of Israel’s courting that movement for its own ends. What they do discuss, though, is quite engaging: how they came to dialogue; ‘borders’; the Holocaust; ‘Posture’. And then they offer some concluding thoughts and a brief Afterword. My reaction to the volume is 90% positive (it really is a finely organized and engaging work) and 10% negative. The absence of the issue of modern Israel is too big a lacuna to simply ignore. It needs to have been included because without it we are genuinely left with a quite truncated and incomplete discussion. The discussion we have, let me hasten to add, is great. But the absence of that one issue is so stark and so inexplicable (in spite of the authorial protest to the contrary) that 9% of me is saddened. The other 1% of my disappointment stems from the fact that the authors do some things that they shouldn’t. Allow me to explain: first, they cite Wikipedia. Why would anyone cite Wikipedia when there are reliable sources available? And second, they haul into the discussion various philosophical perspectives without ever really explaining what those perspectives are. Trocme? Why? In any event, this is a very worthwhile read. I can overlook their use of Wikipedia and their trotting out dead philosophers. I can accept, grimacing, their bypassing of the central issue of our day (Christian Zionism and the State of Israel), and I can heartily recommend this volume to you. If you are concerned about Jewish-Christian relations this work will get the door open and hopefully it will provoke some genuine conversations between genuine people. If it does that, I suspect its authors will be quite pleased. Maybe they’ll be pleased enough to finish the conversation themselves… Stay tuned for Volume 2: Christian Zionism and Modern Israel…. That takes a severe case of mental illness. 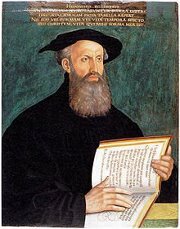 The Catechism of the Church of Geneva: that is a Plan for Instructing Children in the Doctrine of Christ was published on 27 November, 1545. Every citizen of the City was to learn it. It has always been a practice and diligent care of the Church, that children be rightly brought up in Christian doctrine. To do this more conveniently, not only were schools formerly opened and individuals enjoined to teach their families properly, but also it was accepted public custom and practice to examine children in the Churches concerning the specific points which should be common and familiar to all Christians. That this be done in order, a formula was written out, called Catechism or Institute. After this, the devil, miserably rending the Church of God and bringing upon it his fearful destruction (of which the marks are all too evident in most parts of the world), subverted this sacred policy; nor did he leave surviving anything more than certain trivialities, which give rise only to superstitions, without any edifying fruit. Of this kind is that Confirmation, as they call it, made up of gesticulations which are more than ridiculous and suited rather to monkeys, and rest on no foundation. What we now bring forward, therefore, is nothing else than the use of a practice formerly observed by Christians and the true worshippers of God, and never neglected until the Church was wholly corrupted. Learned Christian children make learned Christian adults. And here’s all the proof in one place. So, ‘Christians’, you can stop pretending you aren’t supporting a child molester. Because that’s exactly what you’re doing.